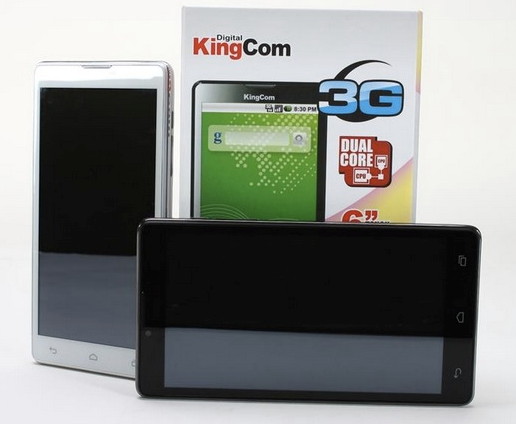 Kingcom Padphone is another Android Device in the market which is not just another Phone but claimed to be the Biggest Smart Phone yet considering its size of 6.1”. Probably thanks to all the success of the Samsung Galaxy Note Series like Note II & Note, following which Huawei has launched the Ascend Mate and other companies are also coming up with large screen devices. The Padphone 61 is a tablet sized phone which comes with a 6” FWVGA display at 480×854 pixels resolution which is not very high but decent enough. Along with this it comes packaged with a 1 Ghz dual-core Mediatek processor and a 512MB Ram which should be sufficient for small applications but when running gaming applications the response should not be great. The Padphone comes packed with 5Mp camera along with a 4Gb Internal Storage which can be expanded upto 32Gb via MicroSD. There is also a front facing camera of VGA quality which should be enough for video calling facility. The best part of this device is the pricing factor which is listed at $278 which is pretty cheap since its almost half the price of the other devices mentioned above and also gives you a decent tablet along with Phone calling facility. Not to forget it comes with a Dual SIM feature ensuring that you can use two SIM cards at the same time which could be another reason to buy, while the 160 PPI makes the device a lower display resolution and would make many people avoid the device. Considering the above mentioned specifications and the disadvantages of low quality display and Android 4.0 would you opt for buy this just for the sake of price and large screen display or would you be willing to spend more and get a branded device? The name looks similar to the Asus Padfone, while the size is around the other phablets in the market and the price is listed to be quite low but still the company is not a well known brand which could be one important reason we would not suggest you to buy this for your daily usage.